The Doug Barnes Cabin is used as a warm-up cabin for skiers in the Birchwood Trail System. The cabin is usually open on weekend days. 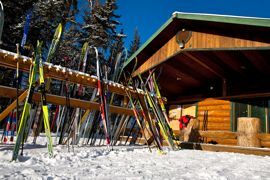 In the spring, summer, and fall, the Ski Club makes the cabin available for use by other Community Groups and for family functions for a nominal fee. In addition, the cabin is available for rent by companies and other institutions.